I can’t go on until I get this off my chest. So, all together now — sing LOUD! Thanks for humoring me. You know you wanted to! I think “wonder” is, well — wonderful! Wonder comes in a moment that is beyond your current understanding and experience. As cultural hubris increases, and authoritative-sounding blowhards abound in media, commerce, politics, health — even in our own social circles — we learn to hide the sense of pure joy that comes from wonder. Wonder is in the space of not-knowing. To culture a sense of wonder is an essential component of self-nurturing. I also believe it is essential, therefore, to our overall health, well-being, and happiness. Cultivating wonder keeps me in touch with the best elements of “myself,” my being, my soul, who-I-want-to-be. It revives the childlike sweetness, openness, vulnerability, and eagerness to learn — qualities that everyday busy-ness will drown out if I am not care-ful and mind-ful. I nurture myself with beauty. I’m not much of an outdoorsy type, so I don’t seek out purple mountain majesties on nature trails. However, I love to watch a thunderstorm gather, build up, and roll in. 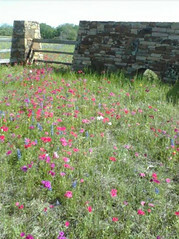 My greatest “nature pleasure” is to go for a drive in the springtime in search of Texas wildflowers. The beauty of sweeping vistas as far as the eye can see, rioting in brilliant color — makes me feel Wonder-Full. Full of wonder at the beauty, the abundance, the sweetness. At all the other flower tourists are out in force, with their cameras and their dressed-up darling children, also feasting on the beauty. I love to look into the eyes of the two adorable cats who have adopted me. The beauty of detail of each hair on Yoda’s velvety coat, the delicacy of Bean’s whiskers and ear tufts are wonderful. I love to go to museums and galleries, concerts, dance, opera — all places to behold and admire beauty shared and expressed. Each performance nurtures me with beauty and cultivates wonder. I also cultivate a sense of wonder by exploring new ideas. I am a huge fan of the TED Conference, and the online videos are a national treasure. I love to hear a person I may never have heard of, speaking passionately about a problem or issue I may not have been aware existed — and feeling energized, excited, and full of wonder as they presented the solution that they had begun. Wonder knocks my socks off. I volunteered for our TEDxHouston in 2010 and was filled with wonder at the amazing ideas presented, and also at the fantastic Houston community that formed around that event. The UP Experience in Houston is another event I love and help with as a volunteer –presenting unique perspectives from unique people — to think deeply and feel inspired to act and participate more fully than I dreamed was possible. That cultivates wonder, looking outward and inward. What am I capable of? I wonder. I continue to be amazed and wonder-filled each day as I practice the Feldenkrais Method, both as a teacher and as a student. With each client, I create a unique process to help them to access their own, highly-individualized capacities to learn, think, sense, and feel — all in the service of improving their ability to function, move, and take action in their lives and in the world. The look of surprise on the face of the beautiful five-year-old as she is able to regain her balance in sitting and not fall over. The look of curiosity and intrigue on the man’s face as his frozen shoulder moves freely again, without pain. The look of discovery and joy as the mother and her adult daughter get to know themselves, and each other, better, over a series of classes. The intricacies of the human brain and nervous system, of personality and personhood. How they can be developed and improved through an exploratory process that uses movement as the catalyst for transformation — the work inspires and elicits wonder. Physical, cognitive, emotional improvements are no less wonderful when they are commonplace. Beauty and wonder are everywhere, and sometimes in the most unlikely places. Wonder gives birth to appreciation and gratitude. It also develops an appetite for more. Now I can’t stop singing that song! I love what you say about wonder being in the “not knowing.” That makes so much simple sense. You’ve made me think about the nature of wonder and that’s pretty cool. Thanks for this post! I couldn’t agree more with this! It’s many of the normal, everyday things in life that are true wonders – and it’s sad that we don’t all take notice more often!